The “partial federal shutdown” is now in its fifth week with no end in sight. It’s time to end it. As you’ve probably seen, heard and read, the shutdown — which affects about a quarter of the federal government — is all about politics. Most simply, President Donald Trump, a Republican, wants $5.7 billion for some kind of border barrier — a “wall,” as he calls it. Congressional Democrats don’t want to give it to him. Rarely mentioned is the fact that Trump had Republican majorities in both the Senate and House of Representatives. Why didn’t this get done during Trump’s first two years in office? As is the case with far too many things in Washington D.C., much of the debate is little more than preening for TV cameras and appeals to core voters. 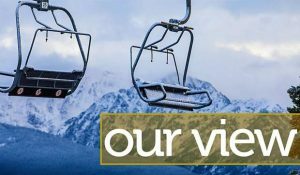 In overall numbers, there aren’t many federal employees in the Vail Valley and other mountain resort areas. But Colorado’s mountain resort economy requires private companies to work hand-in-glove with federal agencies, particularly the U.S. Forest Service and Bureau of Land Management. Virtually all operations have stopped in those two agencies. That means plans have stalled for projects on federal land where resorts operate. That means Vail Resorts’ plans have stalled for expanding McCoy Park at Beaver Creek and snowmaking at Vail. Those are needed projects, and they’re now delayed for some indeterminate length of time. The shutdown also means we need to wait for a decision on whether or not to allow the developers of Berlaimont Estates in Edwards to build a paved road into that property. Our local economy depends on working effectively with federal agencies. It’s also clear that our service-driven resort infrastructure is propped up the “quiet force” of immigrant workers. Beyond that, the locals who work for federal agencies are our friends and neighbors, and we worry about them. It’s frankly ridiculous that our district ranger — who has on-the-ground responsibility for about 700,000 acres of our land — is picking up part-time work as a waiter to make ends meet. Alpine Bank has revived its praiseworthy interest-free loan program, and Gypsum Animal Hospital Tuesday announced it would provide free pet food to federal employees. Those are the sorts of things that make living here such a joy. But the bigwigs in D.C. don’t seem to think about friends and neighbors, only the next power play in their never-ending chess match (although this may be more on the level of checkers). It’s time for everyone to grow up and let people get back to some pretty essential work.